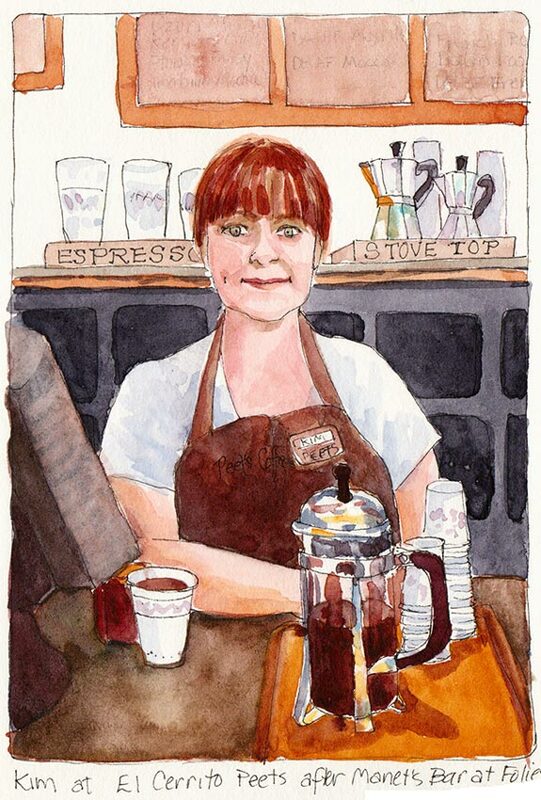 When I walked up to the woman at the counter at Peet’s to order my coffee I started babbling that she looked just like someone in an Impressionist painting. She humored me and asked for my order. 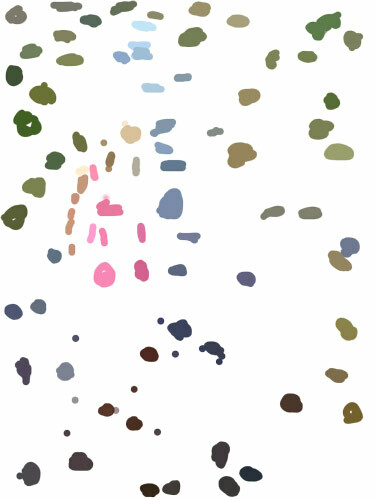 I ordered my latte, went back to my table, and Googled “Impressionist Bar Painting” on my iPhone. It didn’t take long before I found it. I showed her the image on my phone and asked if she’d pose for me like the woman in the painting and she agreed. 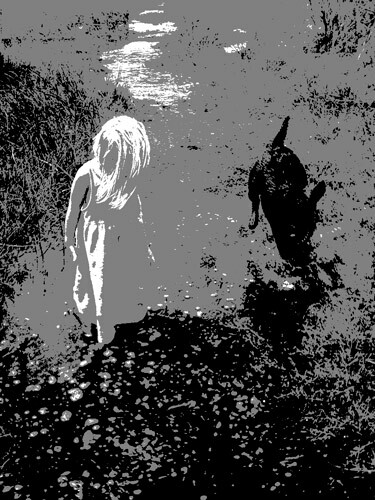 I don’t have permission to post her photo so all I can show you is my sketch, which is a study for a larger painting. Needless to say, I left a good tip for my coffee (and modeling services). And fortunately there wasn’t a line of people waiting for their coffees. I can see that I need to go back to Peet’s to sketch and take more photos so that I can replace the computer monitor on her left with something more beautiful. Or maybe it’s appropriate to be there? 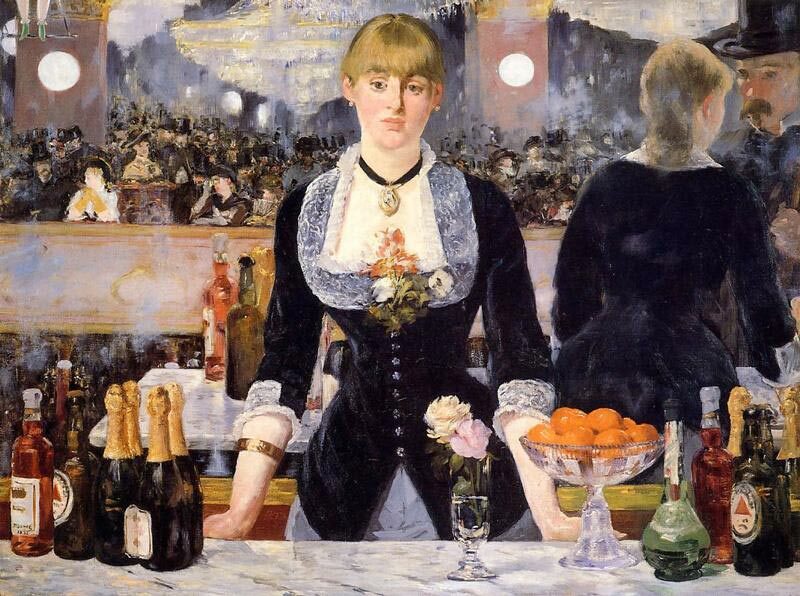 But it sure isn’t as pretty as Manet’s oranges and flowers in crystal. I’m not a fan of crowds, blockbusters or standing in line, but I put up with all the above to visit the Birth of Impressionism show in San Francisco’s De Young Museum in Golden Gate Park. 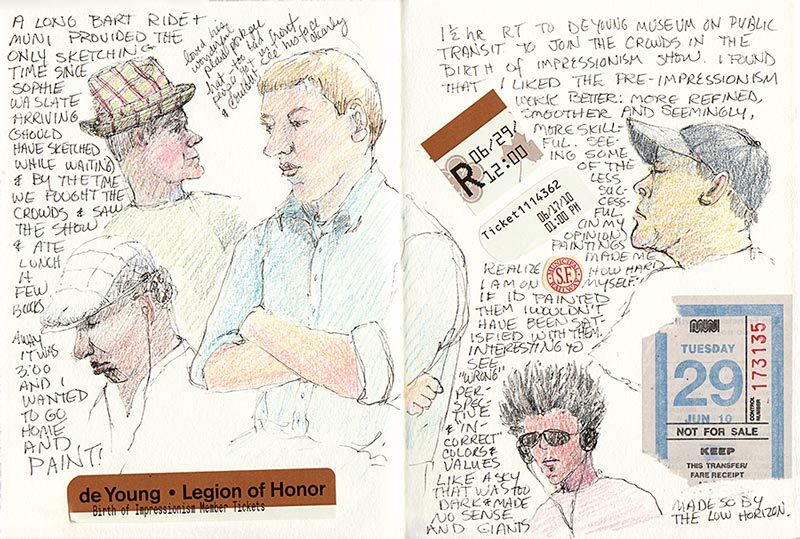 I had planned to sketch in the park after the show but various delays only left time for these done while traveling there and back on BART and SF Muni. I made a number of discoveries at the show and am looking forward to seeing it again, hopefully at a time when it will be less crowded. 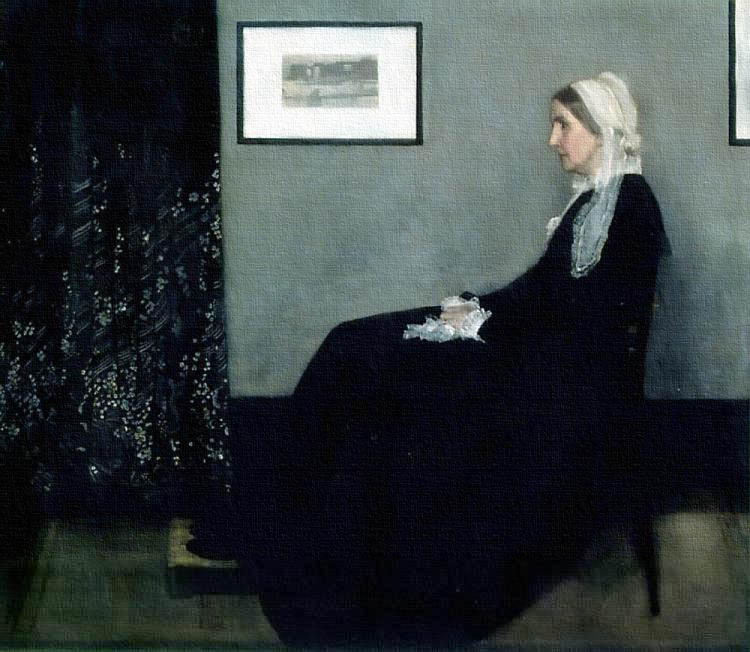 I really enjoyed many of the exquisite pre-impressionist paintings, and especially loved seeing the quite large “Whistler’s Mother” in person. Although the mother’s face appears soft and doughy, I could see in her eyes the universal worries, hope, dreams and sorrow all mothers experience. I was also struck by how unskillfully made some of the early impressionist paintings appeared to me. I found myself thinking that if I’d painted them I wouldn’t have been satisfied with them. That made me consider what a harsh judge I must be of my own work. Then I wondered whether all the paintings in the show (and in museums generally) are considered fine works of art or are included in collections simply because they are historical records of work by famous artists? And now for an abrupt change of topic…. 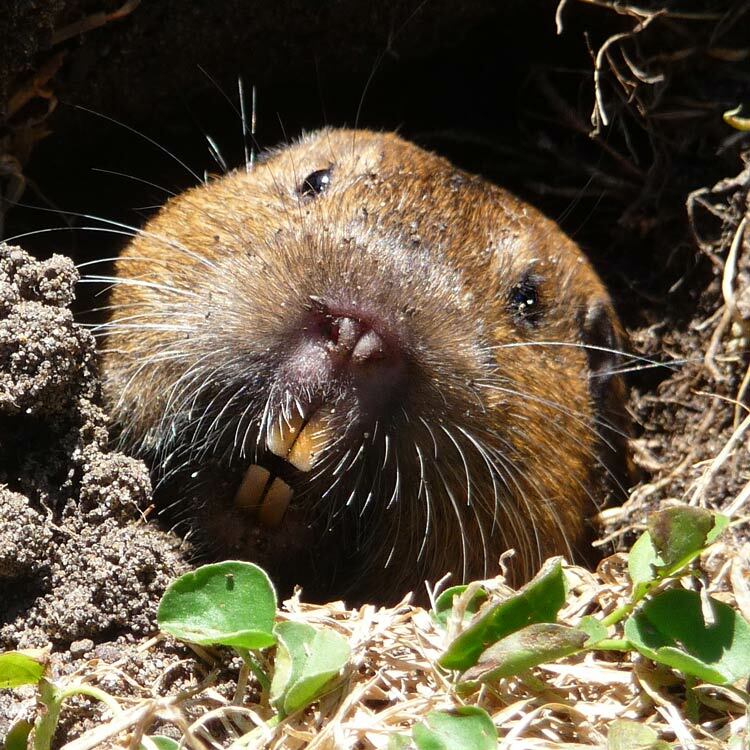 Have you ever seen a gopher close up? 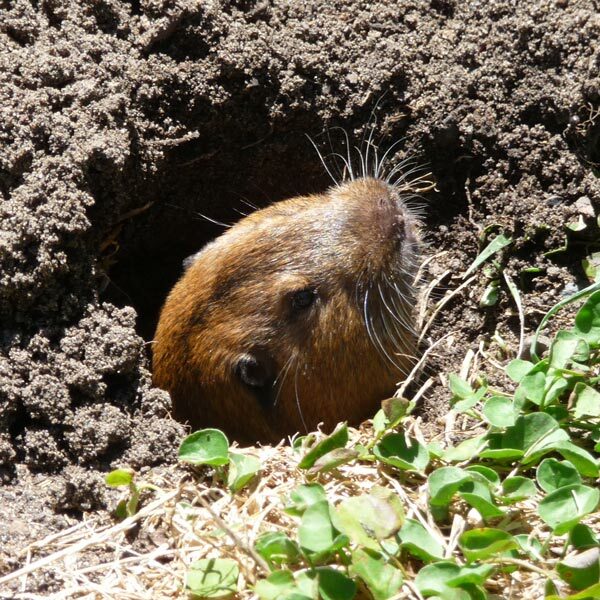 As we left the museum I saw a gopher pop his head out of a hole in the grass. 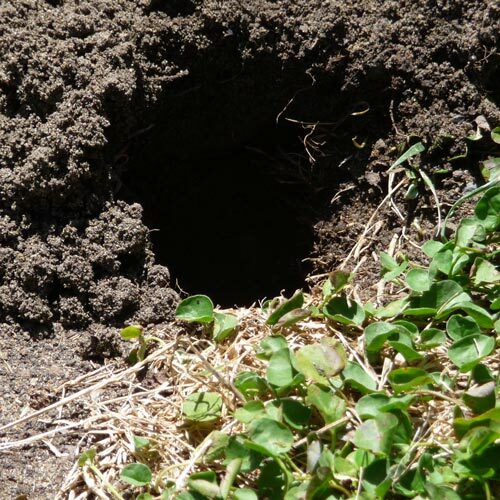 He continued popping up and down, busy pushing dirt out of his hole. I thought he was so cute until I saw the close up (below) on the screen. Yikes! We had gophers in my first San Francisco house. I kept planting things in the garden and the next morning they’d be gone, pulled under ground by a network of gophers. I finally gave up gardening at that house. Between the fog and the gophers it was hopeless. 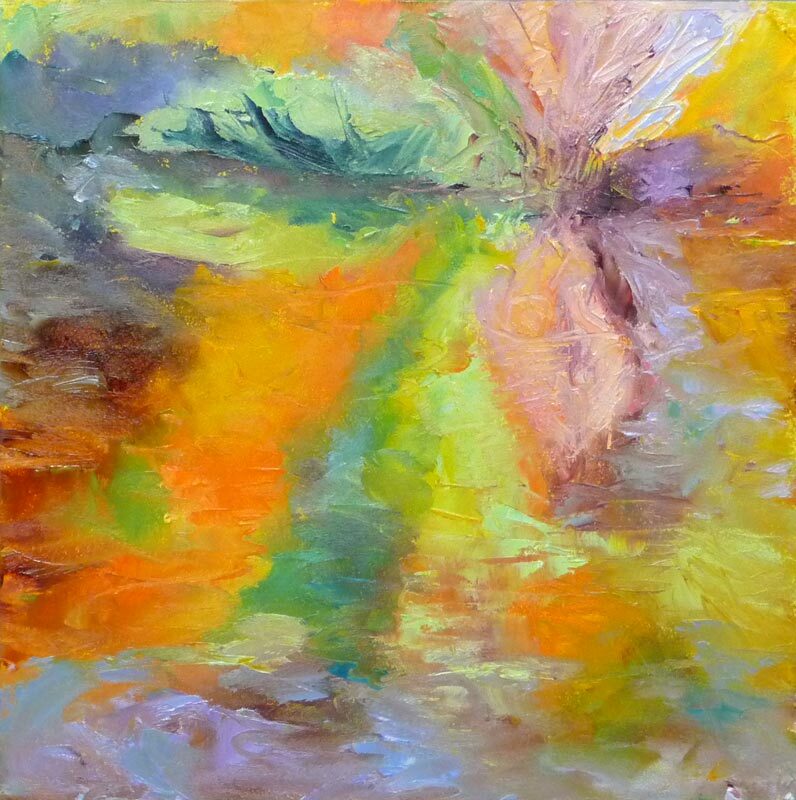 Lake Temescal Reflections, Oil on panel, 8x8"
I have a theory about the paths we take in life, and how important it is to notice what I call “Angels Holding Up Signs” along the way. 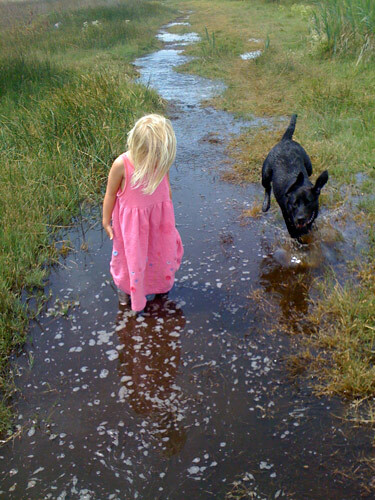 Sometimes those angels take the form of a person offering helpful information or silently pointing the way by example, an intuitive thought, or an unexpected turn of events that makes you pause. When I see or hear an angel holding up a sign, whether it’s “Yield”, “STOP,” or “Go This Way” with an arrow, I consider it a gift and give it serious consideration. Disclaimer: I’m not a New-Age angels and crystals sort of girl. But I do believe there are angels all around us; good, kind, generous people, like Adam at Kragen Auto Parts today who helped me dispose of gallons of old motor oil and their containers that had been abandoned in my garage (long story; don’t get me started!). Thanks Adam! 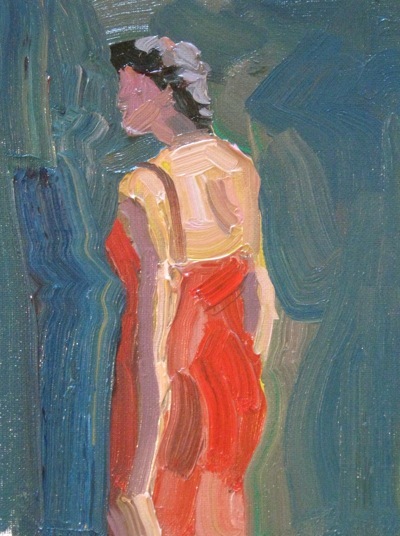 …And like the angels who’ve held up signs in my art life lately, including Kathryn Law and Ed Terpening who’ve both helped me to a breakthrough in my understanding about why simplifying is important in oil painting, especially when painting plein air. I’m always attracted to details, and so I’ve fought against that principle, and then fought my paints trying to put those details into my paintings. 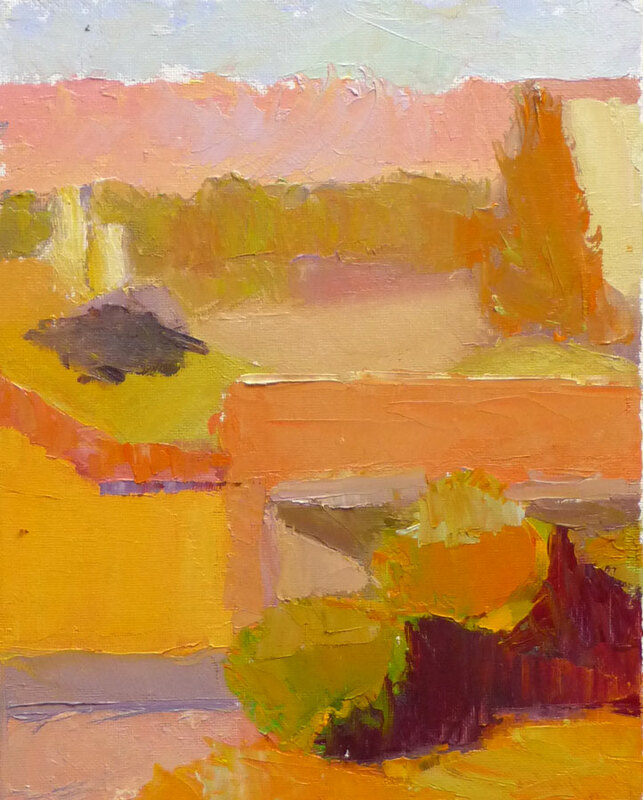 Then I saw these paintings (below) by Ed Terpening on his blog, Life Plein Air, made during a workshop in which the instructor, Peggi Kroll-Roberts, challenged the class to break the scene into as few large shapes as possible and paint those shapes with a large, fully loaded brush in one brush stroke. Each study evoked in me a mood and my mind created a whole life story for each of these women. 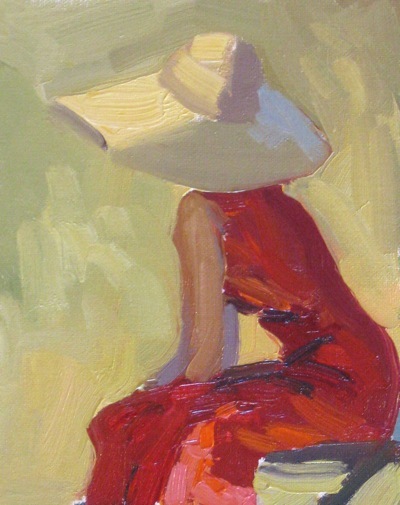 A mom at the beach trying to keep her kids in line; a sad, matron, wondering where her life had gone; a glamorous, young society lady at the country club watching a tennis game while sipping a martini…. How did so much come from such simple paintings? Leaving out the details left it to my mind to fill them in. 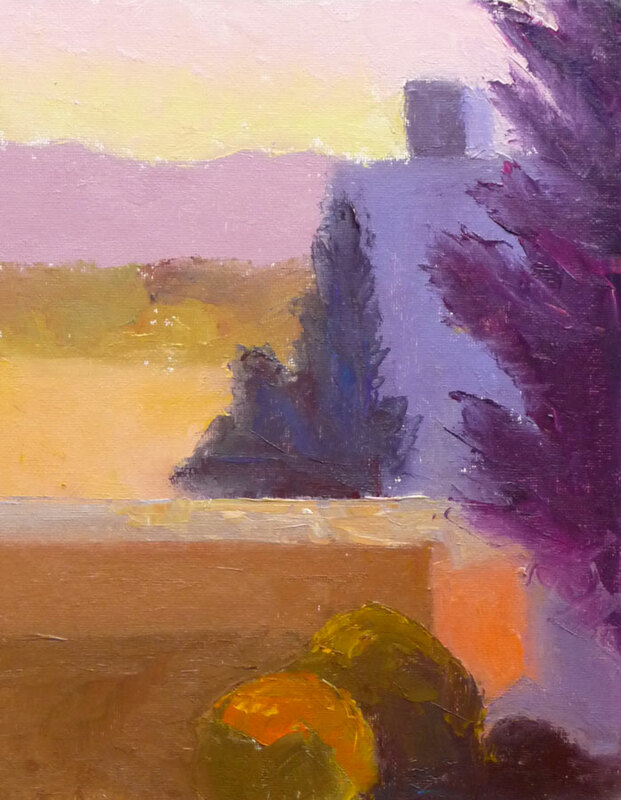 This is something I so needed to learn: that simplifying and omitting detail doesn’t make a painting boring—it lets the viewer’s mind play and be creative, making for an exciting, rewarding experience. Thanks, Ed, for holding up that signpost! And now about my process with today’s painting. 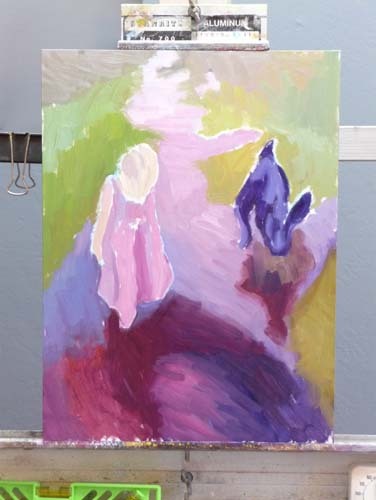 First I tried to simplify by painting large color shapes with the plan to create a color study for a work to be done in the studio. 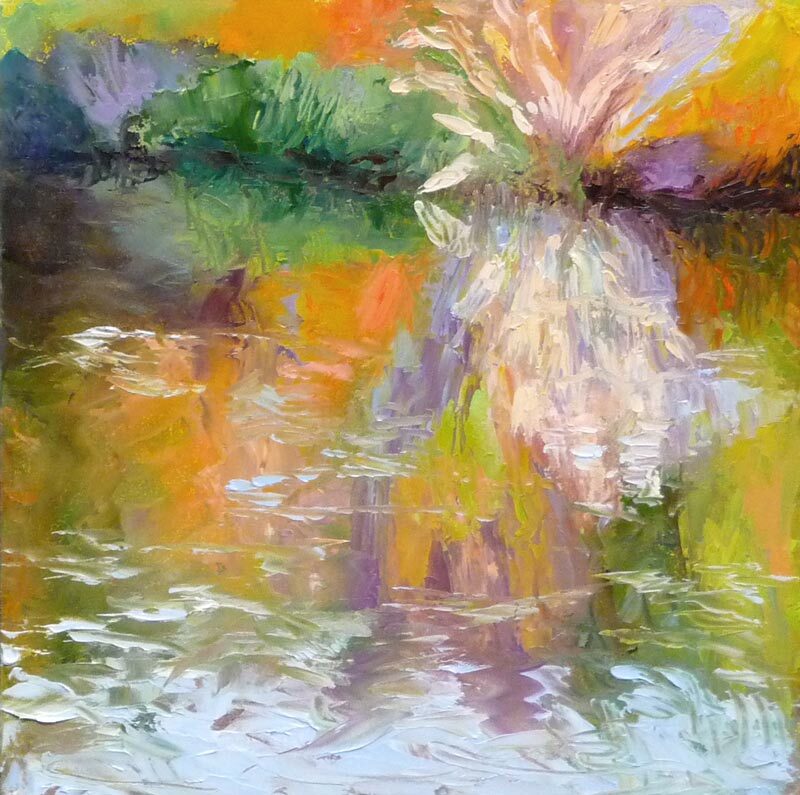 I also focused on the composition, picking a focal point, being careful not to divide the canvas in half as I have a tendency to do, making the subject (the water) the largest portion. But the great thing about palette knife painting is that it’s easy to scrape off passages and repaint them. 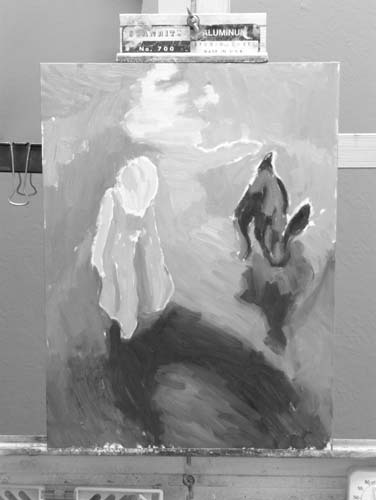 So later that evening I put the photo of Phase 1 on my computer monitor side-by-side with a photo of the scene and worked on the painting until I was satisfied with it (as posted at top). And I’m very happy with another breakthrough: the way I was able to enjoy the plein air painting process without worrying about making a Painting with a capital P while I was out there. 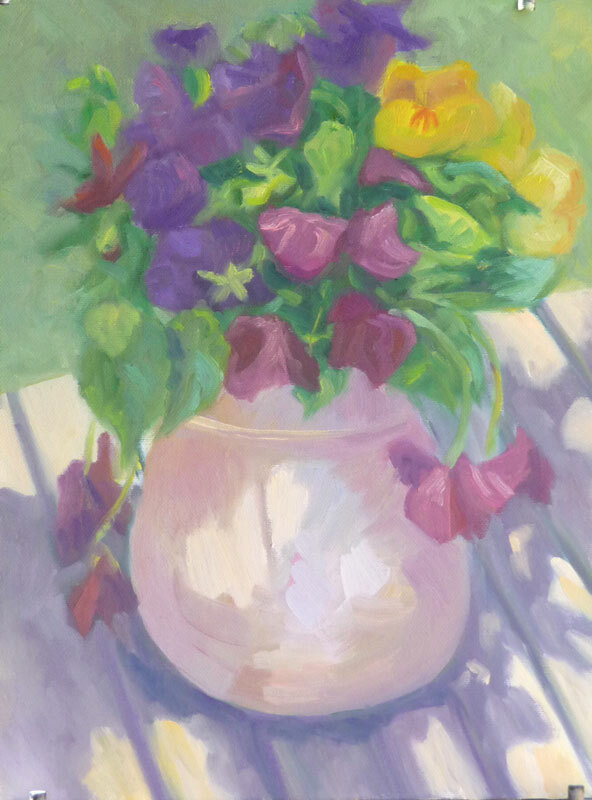 Pansies in Pitcher Plein Air, oil on panel 12x9"
The weather was too perfect to paint indoors but I didn’t feel like driving anywhere. My next door neighbor was out pruning his pansies and he’d pulled out a whole bucketful he was about to put in the compost bin. Voila! A perfect painting subject. 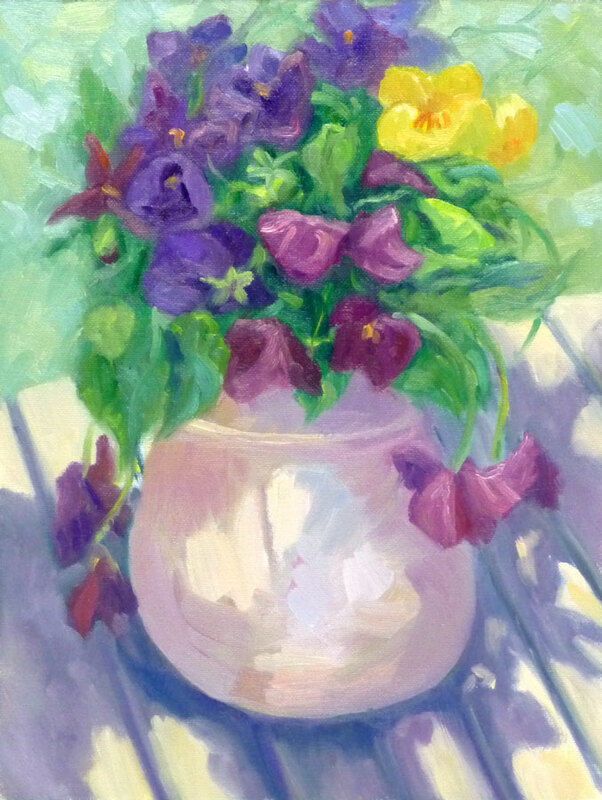 I stuffed a big clump of the pansies into a pitcher and set them on a table in the backyard. I’d made the pitcher as a gift for my friend Barbara in the late 70s when I was a ceramic artist and she was a silversmith. She’s now a brilliant and prolific ceramic artist herself and she recently gave me the pitcher back. She was no longer using it due to a leaky crack and a house full of her own ceramics. I’ve been enjoying using it in still life set ups while fondly remembering it being filled with Mimosas every year for the annual Easter egg hunt and brunch her family held every year while our kids were growing up. I knew that time was very limited before the shade moved across the yard onto the table so I worked quickly and had a great time. 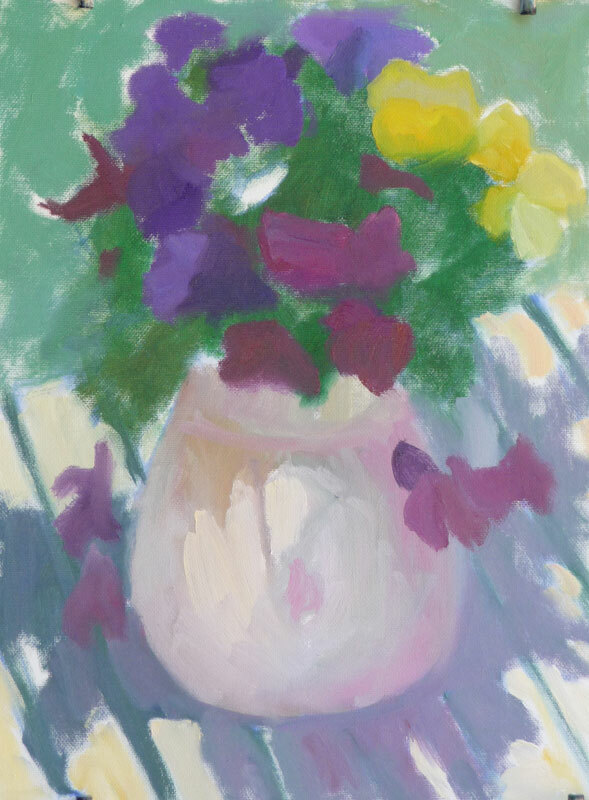 This study was done to practice seeing, mixing and and painting the relationships of color and light on different planes. 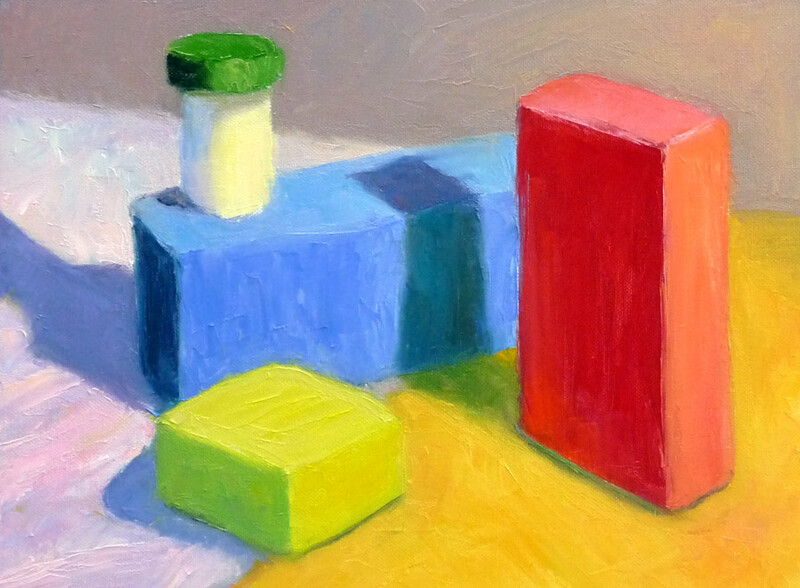 Theoretically these colored block studies should be done outdoors with natural light, but it was a cold windy day and I wasn’t feeling well (and still don’t—first it was stomach flu and now a cold) and so worked indoors. 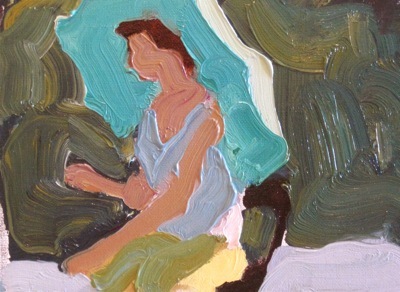 When I compare this indoor painting to those I did outdoors and posted here, I can see why it’s better to work outdoors. “Charles Hawthorne was the first painter…to put the “Impressionist concept of seeing” into a teaching principle. Hawthorne spent the last fifteen years of his life trying to understand what Monet looked for and how he painted. I’ve studied on and off the past year with Camille Przewodek, a fantastic plein air colorist and former student of Hensche and I think I’m beginning to comprehend the concepts at a basic level (although the study above is a poor representation of that). 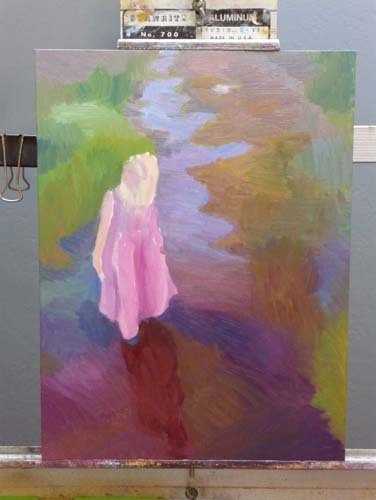 Another painter who studied with Hensche, John Ebersberger, has created a Hensche Facebook group that is open to the public, for former Hensche students and others who are interested in Hensche’s approach to seeing and painting color relationships. 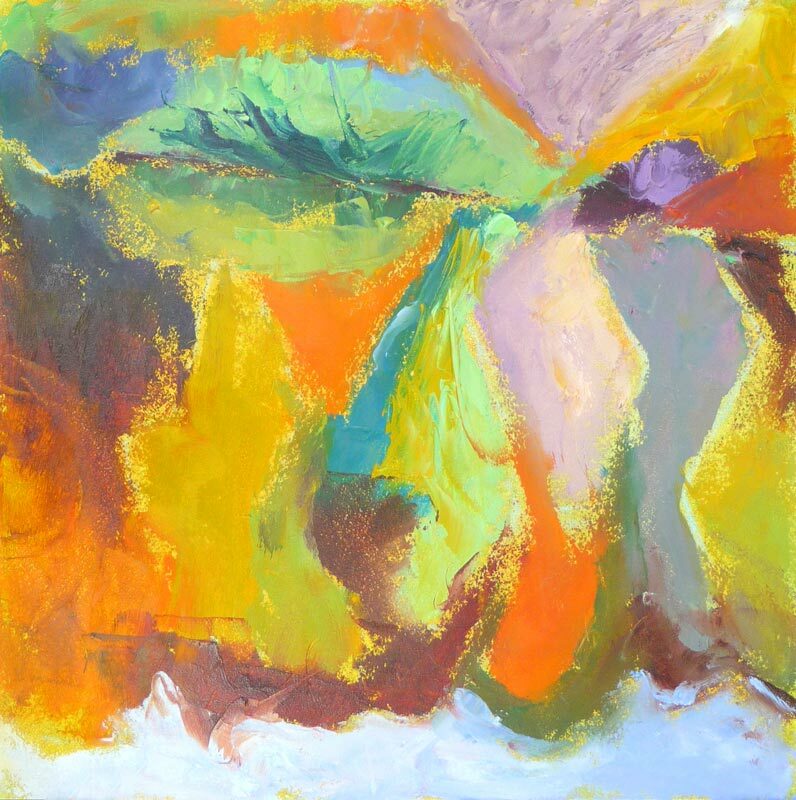 There are wonderful photos posted there of Hensche paintings and paintings by the artists who have carried on his approach to color, and to my mind, have advanced it even further. Their discussions and critiques on the groups discussion board are also quite illuminating. 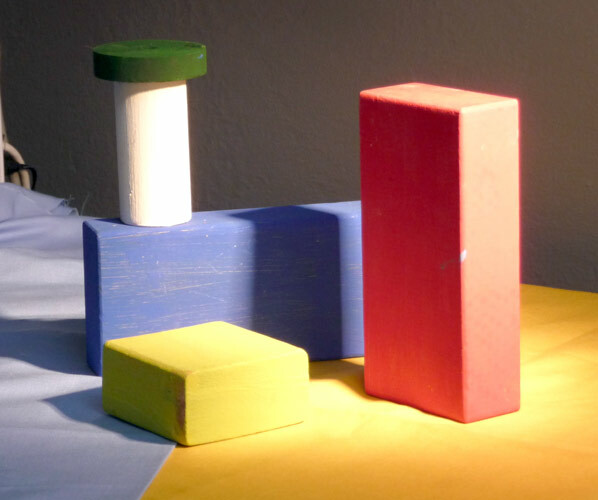 Painting colored blocks under different light is one of the techniques Hensche used to teach students to see that in every plane change there is also a hue or color change (not just a tone or value change), and how these colors change according to the light key (foggy grey light, bright sunlight, early morning light, afternoon light). 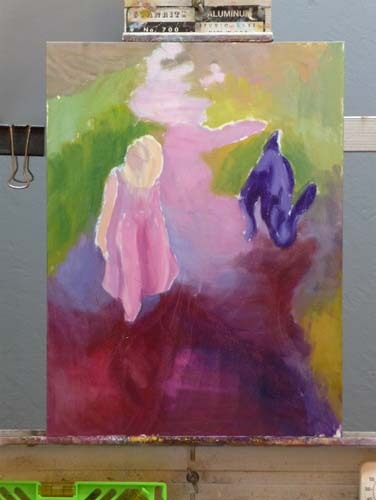 This is not an easy approach and takes years of practice and study, best done with an experienced teacher like Camille Przewodek, John Ebersberger, Carole Gray-Weihman, Dale Axelrod (great links and examples on his website), and others at Atelier aux Couleurs Art Academy who offer workshops locally and internationally. I have found one book, Painting the Impressionist Landscape, that does explains the concepts (although I don’t think that author’s paintings provide stellar examples, especially compared to those listed above). 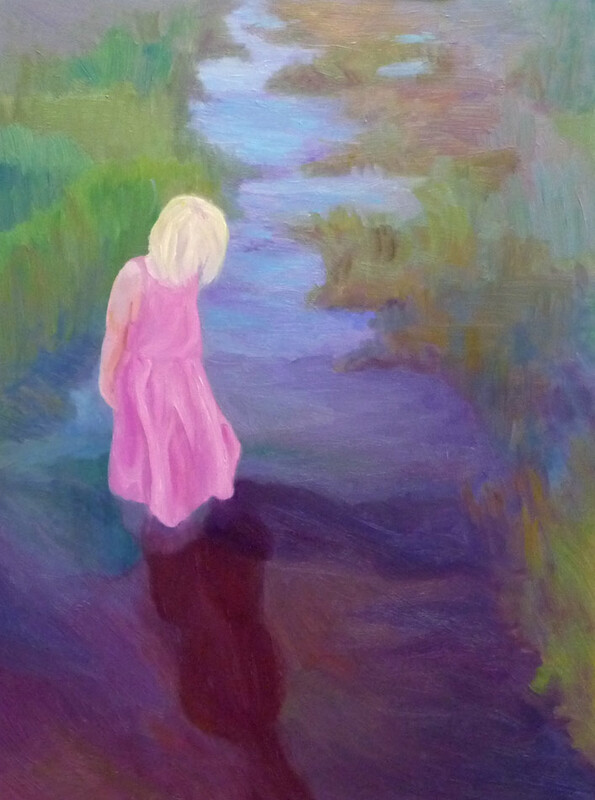 Even if I never learn to see and paint like they do, I’m sure the concepts I am learning will enrich my painting and it has already changed the way I think about light and color and form. I ran a red light right in front of a police car on my way to painting class on Monday. If that wasn’t bad enough, I didn’t even realize I’d done it. I even thought to myself as I drove past the police car that was waiting for the light to change, how nice it is that police don’t look at women like me suspiciously the way they might at young men in loud cars. Seconds later I heard the siren, saw the flashing red lights, and pulled over. The cute, young officer was shaking his head, it was so ridiculous. 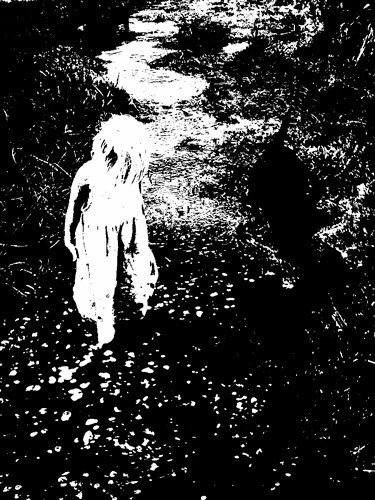 He couldn’t believe what I’d done and, trying to make sense of it, asked if I was distracted, was looking at a light further ahead, etc. I never even saw the other car he told me had had to slam on the brakes to avoid me, and who then looked at the cop as both of them shrugged and shook their heads in amazement for a moment. I eventually figured out what happened. Because I was distracted, the traffic signal had registered in my mind as a stop sign. So I stopped politely, feeling immune to police scrutiny, and then drove on, leaving the officer sitting behind me at the light. Thank goodness there was no damage or injuries (other than to my pride and pocketbook—it’s going to be an expensive ticket). It was a good lesson about driving distracted. I’d been thinking about how late I was AND (hate to admit it) I was on the phone leaving a message for someone (although using the required headset). Camille offered an extra afternoon session Monday so that we could do both a morning study as usual, and a late afternoon study of approximately the same scene to capture the difference in light. I simplified the buildings, trees and landscape to abstract shapes or puzzle pieces, so that I could focus on the colors and light effects. In the morning the foreground and midground was mostly in shadow while the distance was in open sun and the sky appeared a weak yellowish to slightly pink color. In the afternoon everything was front lit with a very warm light. It was a long day and after Camille made some adjustments to my afternoon study and gave suggestions for doing more, I realized I was too tired to paint any longer. I lay down on the grass in the park and spent the last half hour of class sketching a palm tree on my back (I mean I was on my back in the grass; it’s hard enough drawing palm trees, let alone sketching one on my own back!). It had been too long since I laid in the grass on a summer day in the shade of a tree looking up at the sky. I need to do more of that and less rushing around distracted!